Showing 44 articles from November 9, 2016. COUNTING TALLIES. 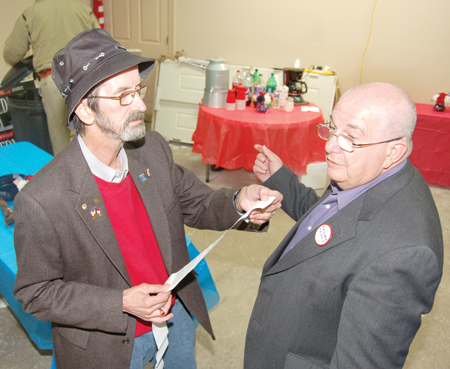 County Commission candidate Danny Pearce, left, and Larry Tucker examine tabulations while hanging out at the Republican Party Headquarters. LOUISBURG -- Just like the nation, Donald Trump secured Franklin County, besting Hillary Clinton by more than 3,500 tallies -- garnering nearly 54 percent of the vote. Trump earned 16,321 votes in Franklin County to Clinton's 12,811 votes. According to unofficial tallies, Trump did not secure the popular vote across the nation, getting 59,058,307 to Clinton's 59,204,408, but he secured the electoral college vote -- a race to 270 -- by getting 276 of those votes to Clinton's 218, making him president-elect if official tallies hold up. LOUISBURG -- Tuesday night's election tally did not produce any suprises in the race for four county commisison seats, but it did produce a razor-thin win for the board's chair. Sidney Dunston took the District 1 seat by 37 votes, squeezing out an unofficial victory over challenger Stuart May. 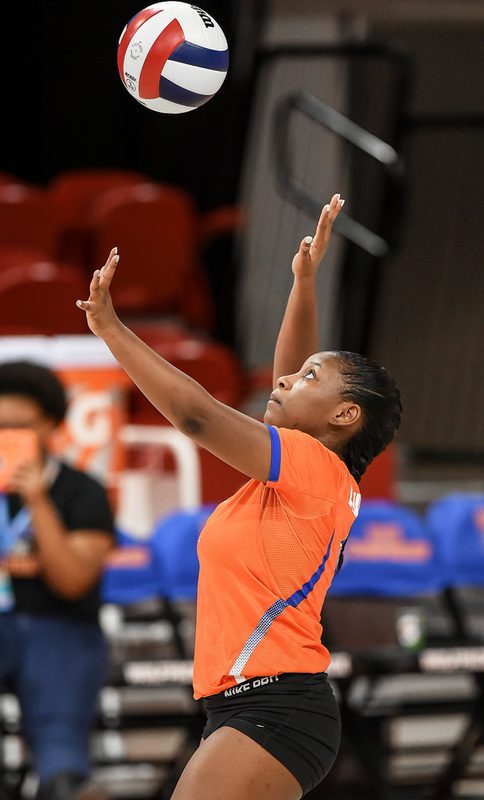 "I'm excited that I was able to eke out a win," Dunston said on Wednesday. 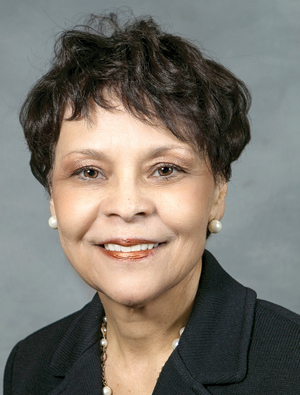 LOUISBURG -- Franklin County will continue to be represented by Bobbie Richardson and Jeff Collins in the N.C. House as both incumbents secured re-election. Richardson retained her District 7 seat, beating out a challenge by newcomer William Hancock II, 23,153 votes to 11,010. She also carried Franklin County with 6,362 votes to 3,334 for Hancock. "I am happy that I won the election and I wish my opponent good deeds," she said. "And, hopefully we can work together." 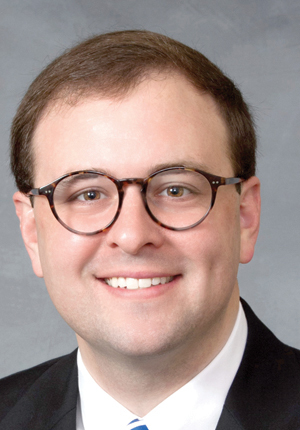 LOUISBURG -- Sen. Chad Barefoot secured another term in the General Assembly, securing the Franklin County vote and district wide support -- capturing 56,656 votes. Democrat and Franklin County Board of Education member Gil Johnson secured 45,705 votes in his attempt to unseat Barefoot. Immediate attempts to contact Barefoot were not successful. 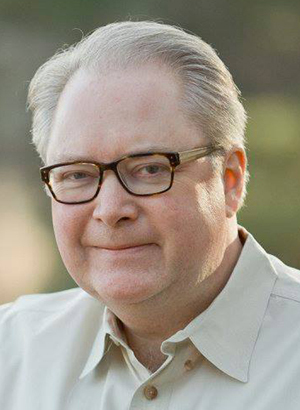 LOUISBURG -- Congressman George Holding cruised to a win Tuesday night, securing more than 56 percent of the vote. His 219,322 votes bested a challenge from newcomer, John McNeil, who garnered 167,297 votes for the Congressional District 2, which includes Franklin County. Holding also beat out McNeil in Franklin County, getting 16,565 votes to 12,958. Immediate attempts to contact Holding were not successful, but published reports reflected his efforts to build the area's finances and protect the country. 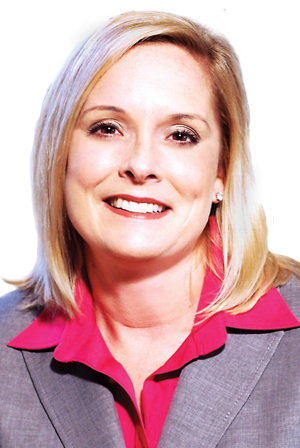 LOUISBURG -- Caroline Burnette continued her run of victories after capturing the most votes during the spring primary by winning a district court judge's seat following Tuesday night's election. Burnette, an attorney and legal counsel for social services departments in Vance and Warren counties was elected to a district court judge's seat representing this area after beating out Quon Bridges, 32,043 votes to 28,580. Since this was written before election tallies were made, I hope you're reading it knowing who will be our nation's president for the next four years. After a divisive, brutal and downright disgusting campaign, whoever is our new president is going to be facing a giant task of trying to actually govern this nation. About the only good thing I can say about this election cycle is that it gave us all a bit of a history lesson. I suspect we are a more familiar with the Electoral College than we were and we've been reminded about why some of the Founding Fathers had such a fear of a two-party political system. A nationally known expert in using historic preservation as an economic development tool spent more than an hour last Thursday evening discussing the concepts and presenting concrete examples of what has worked across North Carolina. 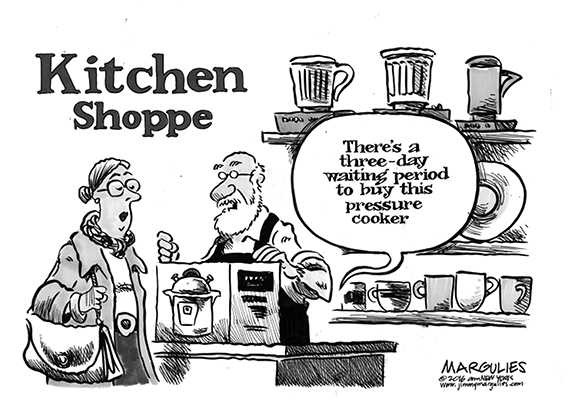 Unfortunately, Preservation North Carolina's Myrick Howard was preaching to the choir. Most of the nearly 60 people attending already have a strong interest in historic preservation, many have restored homes and other structures and virtually all of them realize that historic preservation is one of the "legs" upon which the future of Louisburg and Franklin County must stand. 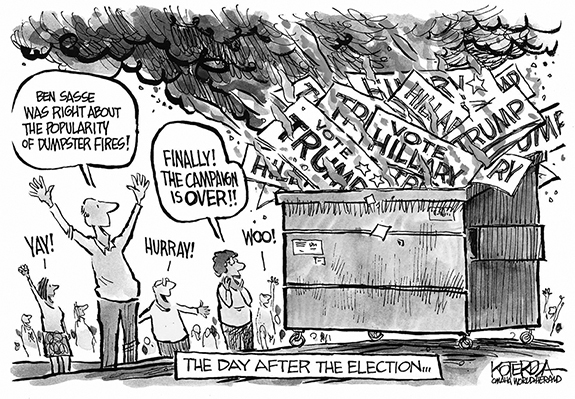 While Tuesday night's election might have seemed like life or death to some, it was not. What has been life or death, though, is traveling area roads just over the last month. By my count, there have been 10 fatal wrecks either involving Franklin County people or reported on Franklin County roads in just over a month's time. And I've heard that during that time, there were two more reported in Vance County. 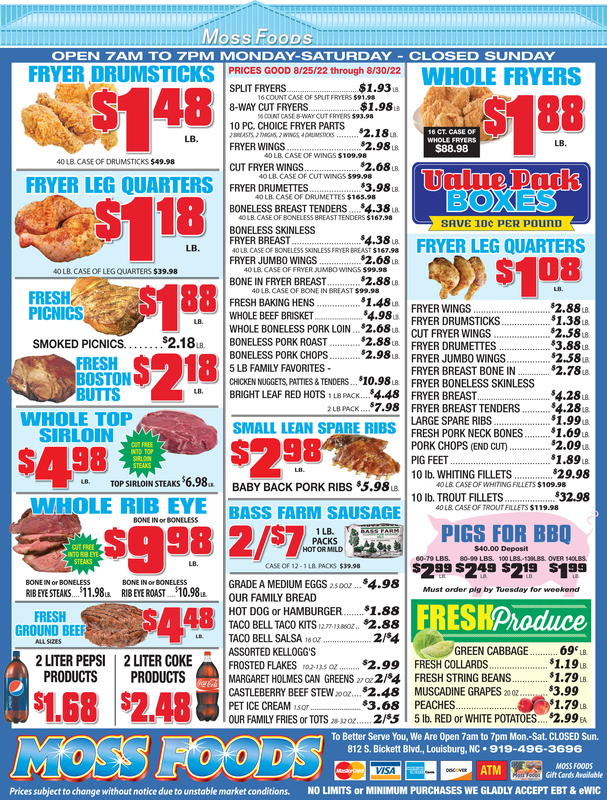 Logistically, this is a challenging article to write. My subject matter is almost always political in nature and this article is being written prior to the election for publication purposes. So I decided to write about some of the things that come with election time that I won't miss. Generally somewhere between one-third and half of my readers disagree with me; I think that will be very different this week. I smell a rat and the stench is bad. I am elated that we finally have a contract for Duke Lifepoint to open an ER and other health care benefits. The timing of the announcement sent up a red flag. Was it planned to be announced less than two weeks before the election? I think so. RANDALLSTOWN-MD - Julius "Pete" Williams, 68, a former resident of Franklin County, died Saturday, Nov. 5, 2016. Home going services are planned for Friday, Nov. 11, at March Life Tribute Center - Randallstown, 5616 Old Court Road, Randallstown, Md. Family and friends will be received for the wake at 1:30 p.m. and services to follow at 2 pm. FANTASTIC FINISH. 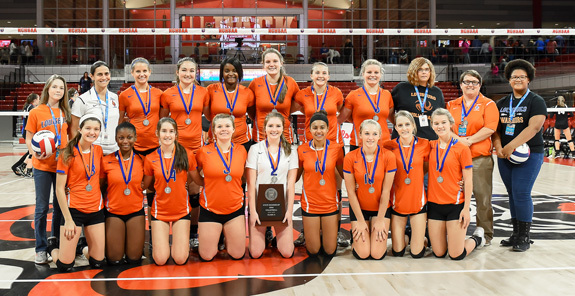 Members of the Louisburg High School volleyball team pose with the state runner-up plaque following last Saturday's Class 1-A State Championship Match at Reynolds Coliseum in Raleigh. RALEIGH - Louisburg's quest for a perfect ending -- literally -- wasn't meant to be last Saturday at the Class 1-A State Volleyball Championship Match. 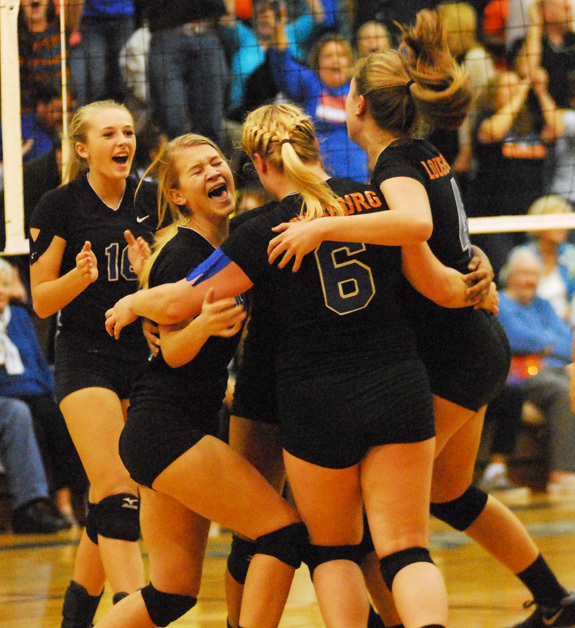 But the Lady Warriors' three-set loss to powerful Community School of Davidson at Reynolds Coliseum didn't deter from a strong campaign that featured an unblemished mark heading into the finals -- along with the school's first East Regional crown since 2007. "We had a great year, and making the state championship match was really big for our program,'' Wammock said. CAUGHT IN THE MIDDLE. 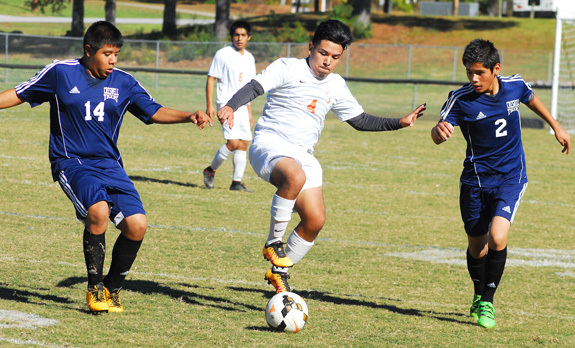 Louisburg High School's Jorge Hinostrosa (center) dribbles between two Creswell defenders during Saturday's first-round action of the Class 1-A Boys Soccer State Playoffs. LOUISBURG -- In the estimation of observers close to the program, Louisburg fielded one of its best-ever boys soccer squads this fall -- and the proof was in the numbers. 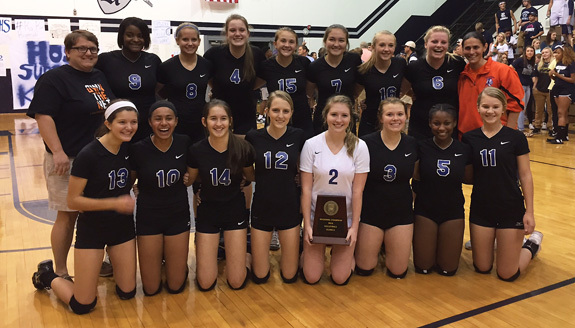 The Warriors went 10-6 overall and dropped just one match in the Tar-Roanoke Athletic Conference while sharing the regular season crown with Granville Central. LHS then advanced to the second round of the Class 1-A State Playoffs before falling 6-2 at home on Tuesday to Spring Creek at Joyner. BIG SEASON. Senior Quamon Person is enjoying a tremendous campaign in the backfield for the Louisburg High School football squad. 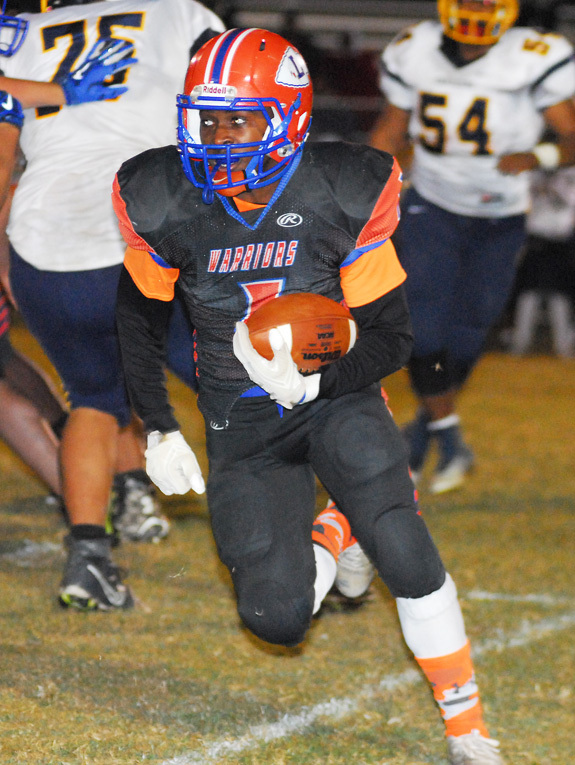 LOUISBURG -- Quamon Person's final regular season home football game for the Loiusburg Warriors was one to remember -- and Person's Herculean effort helped LHS wrap up second place in the Tar-Roanoke Athletic Conference. Person rushed for five touchdowns as Louisburg surged past Weldon 56-28 last Friday at Patterson Field to close out the regular season. Louisburg finishes at 6-4 overall to go with a 3-1 mark in the TRAC. BEST FOOT FORWARD. Bunn High School's Edson Servin (right) advances the ball in acrobatic fashion during last Saturday afternoon's home playoff victory against the North Lenoir Hawks. 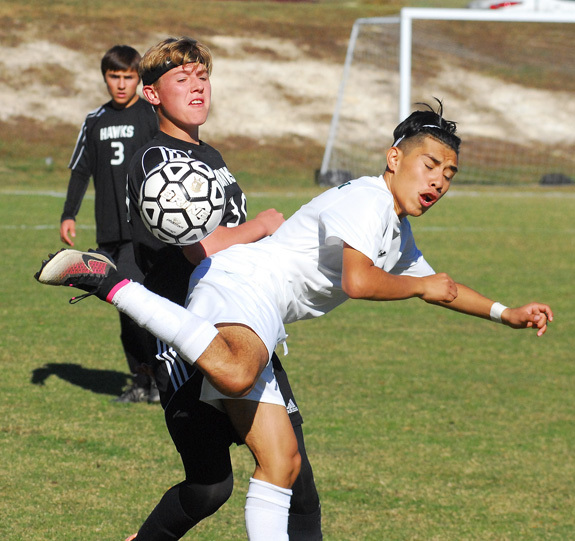 BUNN -- It was a deflating feeling for the Bunn Wildcats when they had their undefeated boys soccer campaign spoiled two weeks ago in the regular season finale at home against Roanoke Rapids. Though it stung at the time, BHS veteran head coach Charles Haley saw a silver lining in the tough setback. "It was probably the best thing that could have happened to us,'' Haley said. REGIONAL CHAMPS. Members of the Louisburg High School show off their plaque from the Eastern Regional title. WILLIAMSTON -- Not matter what the sport, there are moments that define a team's legacy -- and they often take place far away from its comfort zone. That's why Louisburg High School volleyball coach Erica Wammock was unfazed when she found out the undefeated Lady Warriors, due to a tie-breaker, would be on the road last Thursday at Williamston Riverside in the East Regional Final (and state semifinal) of the Class 2-A State Playoffs. "We had gone to Riverside two years ago in the softball playoffs, and their fans got to us,'' Wammock said. 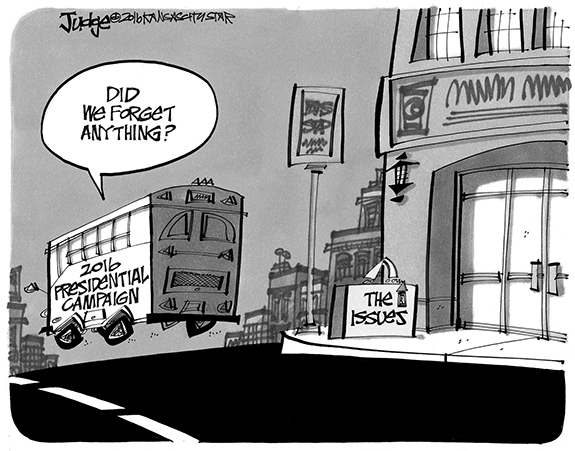 "I wanted to make sure that didn't happen this time. GREENVILLE -- Turner Brown collected a pair of hits and scored two runs, while Jake Washer drove in three runs helping the Gold squad to a 6-2 sweep of Purple in the 2016 Purple-Gold World Series Sunday afternoon at Lewis Field inside Clark-LeClair Stadium. Brown, who tallied a series-best nine hits, registered his third multi-hit game of the weekend leading the Gold with a .529 (9-for-17) average. Spencer Brickhouse, a freshman from Bunn High School, drove in the would-be game winning run on a triple in the bottom of the second and finished with a series-best five RBI. BUNN -- David Howle's 12th and final league championship as Bunn High School's head football coach was secured in impressive fashion last Friday at Warren County. Howle's Wildcats had racked up 56 points by halftime and went on to defeat the host Eagles by a 70-35 margin to wrap up the outright portion of the Northern Carolina Conference football crown. TEAMING UP FOR A TACKLE. Franklinton\'s Marcus Wright (l) and Josiah Trotter (r) combine to make a stop for the Red Rams during last Friday\'s road football decision against Southern Vance. 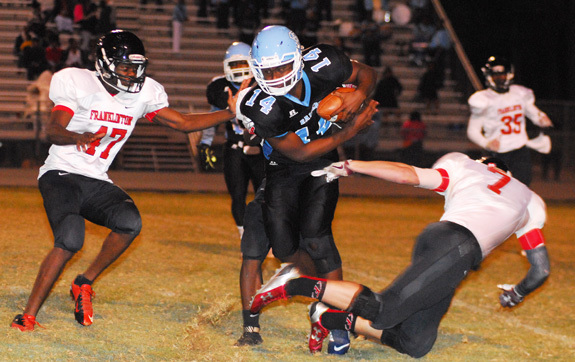 HENDERSON -- Needing a clutch performance to wrap up a winning regular season record -- and help secure their playoff standing -- the Franklinton Red Rams got exactly that during last Friday's Northern Carolina Conference finale at Southern Vance. Taking on the winless Runnin' Raiders, Franklinton erupted to a 24-point halftime cushion and never looked back en route to topping host SVHS by a 41-14 margin. 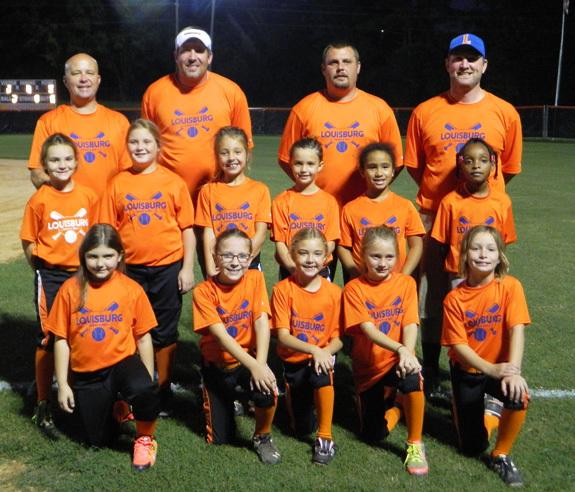 The Louisburg Parks and Recreation Department's 8-Under Fall Ball Girls Coach-Pitch team recently wrapped up its schedule with a perfect 10-0 record against area opponents. Louisburg High School volleyball players rejoice after the final point of last Thursday's Class 1-A East Regional final at Williamston Riverside. Journee Hartsfield serves for Louisburg HS. 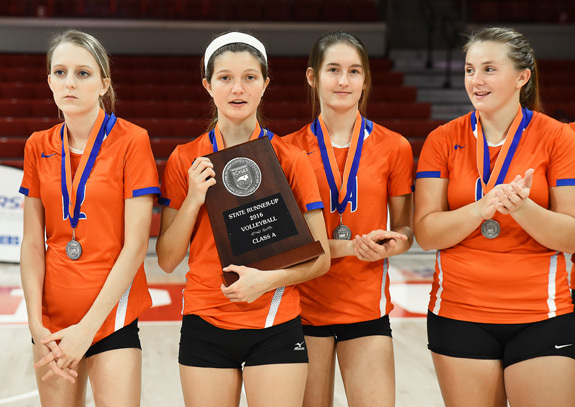 Louisburg High School's Mackenzie Wood (second from left) proudly holds on to the state runner-up plaque following last Saturday's championship spike showdown. 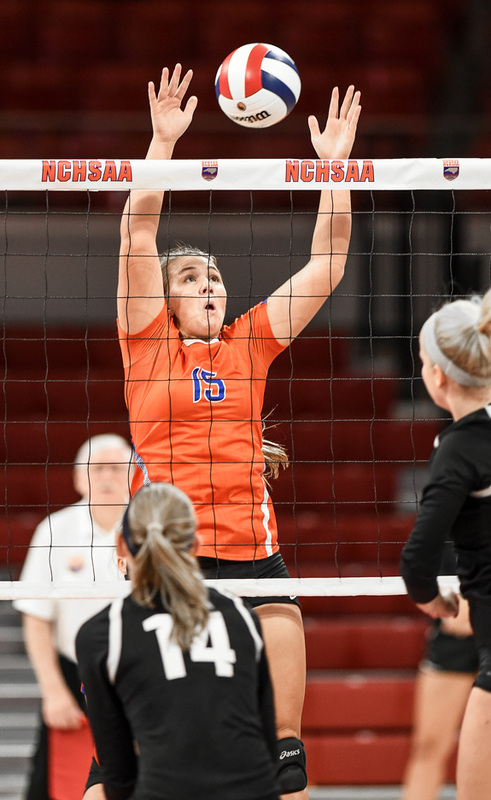 Louisburg High School's Summer Phillips goes up for a block attempt during last Saturday's action at the Class 1-A State Volleyball Championships at Reynolds Coliseum in Raleigh. 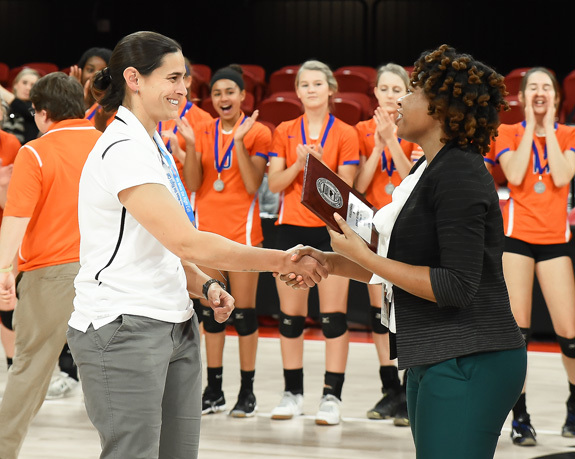 Louisburg High School head volleyball coach Erica Wammock (left) accepts the state runner-up plaque last Saturday night in Raleigh. 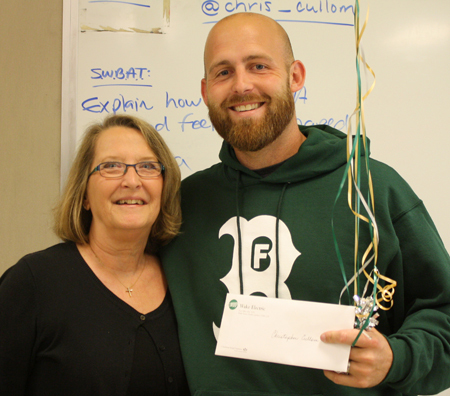 Wake Electric recently surprised Bunn High School teacher Christopher Cullom (right) with a Bright Ideas grant check for his idea to expand the school's Power Lunch program. The co-op awards Bright Ideas grants annually for creative classroom ideas and projects. Darnell Alford, Bright Ideas program administrator, presented the check to Cullom (along with balloons) during one of his classes. Cullom's grant is to help continue and expand a successful tutorial program that provides academic assistance and tutoring to students in need. Flanking Clara Frazier (center) are Alex Cheek and Jamie Patrick, director of annual giving and alumni relations. Louisburg College honored five members of its community recently during an alumni brunch as part of its Homecoming celebration. 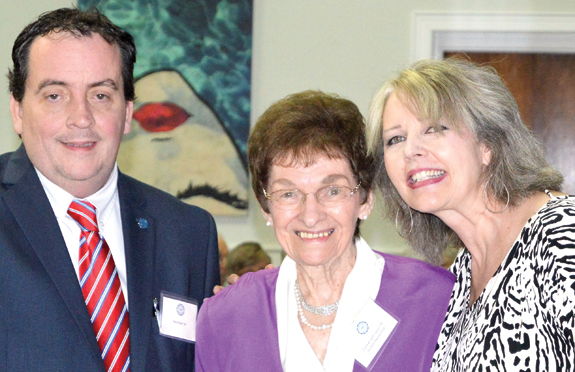 The Allen de Hart Humanitarian Award, honoring the late Louisburg College professor, benefactor and advocate for the arts, was presented to Clara Frazier, retired chemistry professor and environmental steward. Frazier, Class of '55, joined the Louisburg College faculty in 1962, helped with the college's concert series, served on the Franklin County Board of Supervisors and has pushed for recycling, writing a column for The Franklin Times, Clara's Conservation Corner. 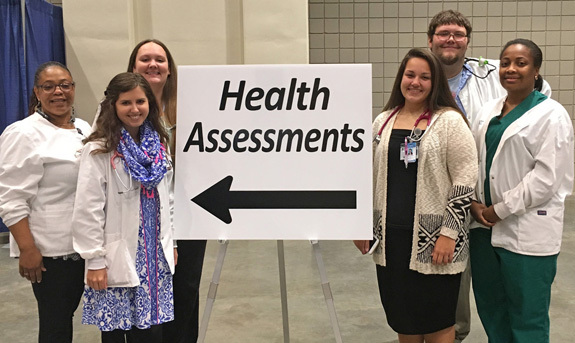 RALEIGH -- Six students from the Student Nurses' Association (SNA) at Vance-Granville Community College, including three Franklin County residents, attended the North Carolina Community College System Conference in October to assist with health assessments for participants, who included faculty, staff and administrators from throughout the 58-member college system. The students included Rachel Edwards of Louisburg, Deborah Janifer of Youngsville, Trey Wright of Franklinton, Heather Avery of Wake Forest, Ladonya Tinnin of Durham and Sara Wheeler of Raleigh. LOUISBURG -- Franklin County commissioners approved an incentive and a resolution that will aid a Youngsville company double in size and create 100 new jobs. Last week, Gov. 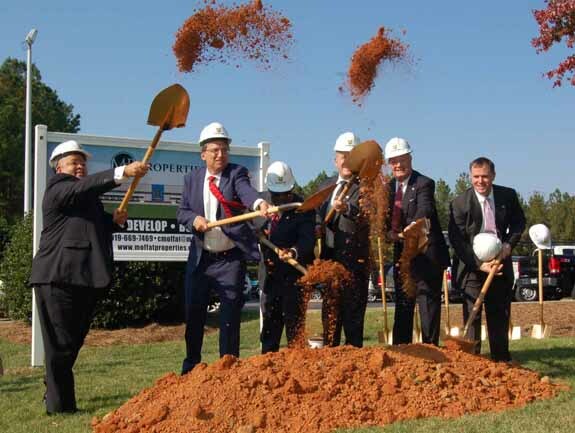 Pat McCrory appeared at a ground-breaking ceremony to announce that the state approved a $1.1 million job development grant that will aid K-Flex USA's expansion plans in Youngsville. On Monday night, the Franklin County Board of Commissioners unanimously agreed to provide K-Flex with a $1.3 million incentive per its economic development policy. YOUNGSVILLE -- K-Flex is taking an aggressive approach to becoming a leading manufacturer of a rubber product with a myriad of applications and Gov. Pat McCrory toured the site -- media in tow -- to get a look at the company's push to expand. 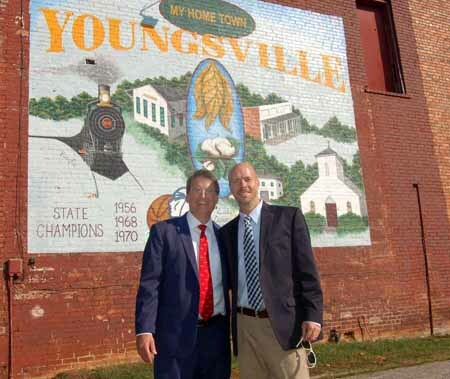 Shortly thereafter, he took a more quiet tour, away from the media bustle and the hum of machinery, but it was of a place that leaders are no less convinced is on the cusp of mushrooming, too -- downtown Youngsville. 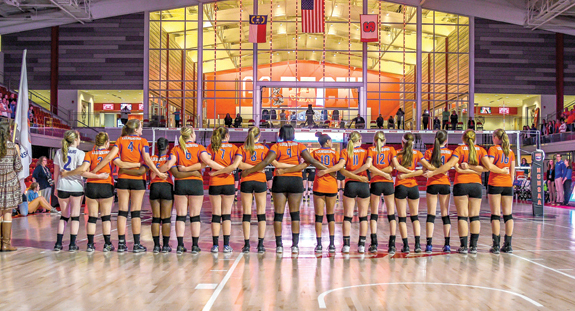 Members of the Louisburg High School volleyball team stand during pre-match introductions at last Saturday's Class 1-A State Championship Match at Reynolds Coliseum in Raleigh. LHS was making its first appearance in the finals since 2007. LOUISBURG -- Historic preservation is as much "about people as it is about place," said Preservation North Carolina President J. Myrick Howard last Thursday evening as he addressed a small group that attended the latest meeting in the series "Historic Preservation: Building Community and Enhancing Prosperity." The lecture series, sponsored by the Tar River Center for History and Culture at Louisburg College, is intended to bring together those interested in local history and architecture as well as those focused on economic development. HOLDING COURT. 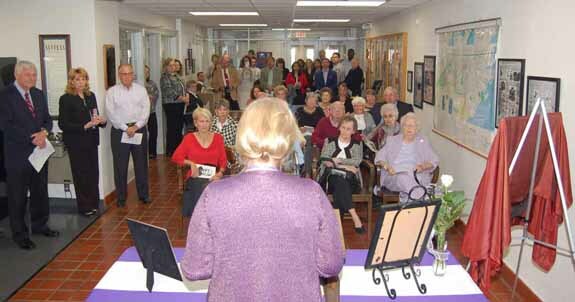 Heritage Society of Franklin County President Diane Taylor Torrent, foreground, shares a bit of history about Joseph James Barrow with a crowd that gathered inside the Franklin County Courthouse for the unveiling of his picture. LOUISBURG -- For 20 years after the turn of the 20th century, Joseph James Barrow was a fixture in the offices, courtrooms and corridors of the courthouse as the county's Clerk of Superior Court. Now, his visage will be a fixture too, as members of the Heritage Society of Franklin County located a picture of Barrow and, following a ceremony last week, will hang it in the magistrate's courtroom of the main courthouse on Main Street. LOUISBURG -- A Youngsville man whom authorities allege played a role in a multi-county chop shop operation pled guilty in court recently. Roger Nipper avoided jail time, but it'll cost him more than $22,000 in restitution and he'll have to keep his nose clean for at least five years. State Department of Motor Vehicle agents and Franklin County Sheriff's Office investigators arrested Nipper in January 2014, alleging Nipper was housing stolen truck and machine engines and parts at his Moores Pond Road property, preparing them for sale to salvage yards across the state. BUNN -- Town commissioners agreed Monday night to raise water and sewer rates, an action that will take effect after the first of the year. Town Clerk Judy Jeffreys said she became curious about whether the town's utility charges were keeping pace with debt service and inflation after reading some information posted by the N.C. Rural Water Association -- a trade association originally formed to be a collective voice for water and wastewater systems operators across the state. Keeble Davis, 38, of Youngsville, behind the steering wheel, escaped serious injury on Monday afternoon after she ran into the back of a tractor trailer on Bickett Boulevard near the intersection of N.C. 56/581. Heather Gwin of Warrenton, center, a nurse who happened to be heading by, was one of the first people on the scene and helped stabilize Keeble. FRANKLIN COUNTY -- In the last month, there have been eight fatal wrecks either in Franklin County or involving Franklin County residents. The most recent was reported on Nov. 2 when Percy Jones, 54, was traveling in the roadway of N.C. 561 after dark on a riding lawn mower when he was hit from behind. Jones, who had a Louisburg and a Bunn address, died at the scene. The Youth Department of the Franklin County Missionary Union recently held a hot dog and clothing giveaway in Riverbend and many people braved the wind and cool weather to fellowship with the young people. Many household items, books, clothing, hot dogs, and drinks were given away. Youth Director, the Reverend Cora Campbell, with the assistance of youth department helpers, Reverend Rosemary Cooper and Reverend Dexter Wright, organized the event. Cool cars and kids: Now there's a perfect match! COOL RIDES. 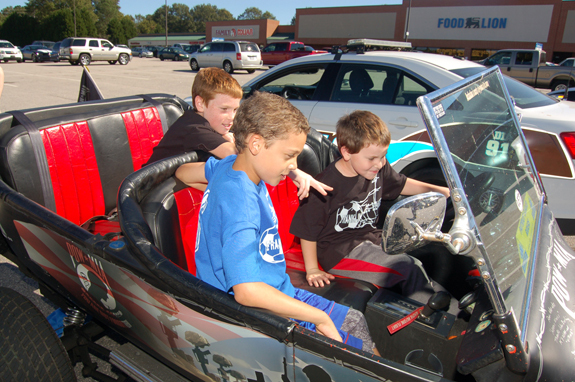 Above, from left to right, Joshua Pearce, Joshua Green and Brayden Pearce check out the POW Bucket, a hot rod restored by Wayne Daniels and his family and used to raise awareness about soldiers who are missing in action or prisoners of war. 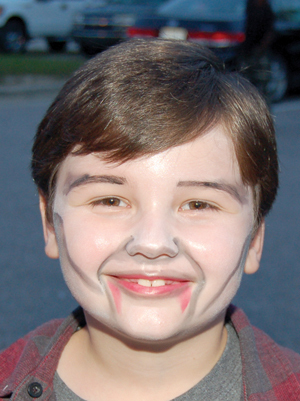 The car was part of an Oct. 24 show hosted by the Franklinton Parks and Recreation Association as a fundraiser.